At the risk of being Captain Obvious, you’re going to need a spreadsheet if you want to follow along with this post. 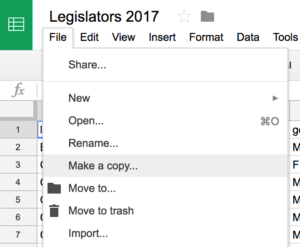 If you don’t have one on hand that’s full of juicy data, might I suggest you make a copy of this spreadsheet with contact information for all United States legislators? (Side note: Ian Webster uses this data in conjunction with Twilio to make it easy for citizens to call congress). To programmatically access your spreadsheet, you’ll need to create a service account and OAuth2 credentials from the Google API Console. If you’ve been traumatized by OAuth2 development before, don’t worry; service accounts are way easier to use. Follow along with the steps and GIF below. You’ll be in and out of the console in 60 seconds (much like Nic Cage in your favorite Nic Cage movie). If you skip this step, you’ll get a gspread.exceptions.SpreadsheetNotFound error when you try to access the spreadsheet from Python. 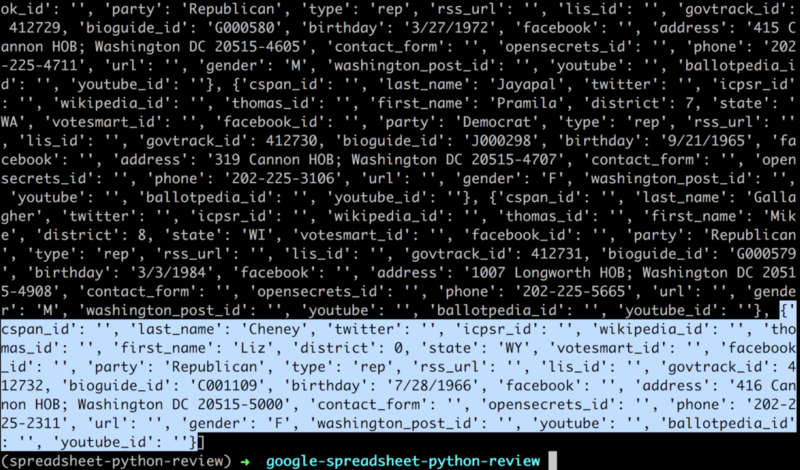 Run python spreadsheet.py and marvel at the glorious, well-formatted data. We’ve just scratched the surface of gspreads’ well documented and comprehensive functionality. Check the gspread API reference for the full details on these functions along with a few dozen others. Using Google Spreadsheets with Python opens possibilities like building a Flask app with a spreadsheet as the persistence layer, or importing data from a Google spreadsheet into Jupyter Notebooks and doing analysis in Pandas. If you want to start playing with Python and Twilio, check out our Python quickstarts. If you build something cool, please let me know. You can find me at gb@twilio.com or @greggyb. And if this post was helpful, please share it with someone else who might dig it. Many thanks to Devin and Sam for the reviews, to Google for Sheets, and most of all, to Anton for gspread.